Santana built Land Rovers under licence in Spain for many years. Santana also devised unique local variations such as their own 6-cylinder motor, the Modele 2000 forward control Land Rover, and a military lightweight Land Rover. The Santana 6-cylinder engine is not the usual 2.6L Solihull Rover but a Spanish version of the rugged four cylinder 2.25L motor stretched by one and half times to give two extra cylinders and a capacity of 3429cc. A Gardia (police) Santana Land Rover can be seen in the film Monsignor Qixote (1985), starring Alec Guinness and Leo McKern and based on Graham Greene's modern adaption of Don Quixote: An aged priest travels through Spain in his ricketty car, Rosinante, having Quixotic adventures -- Lloyd Allison. 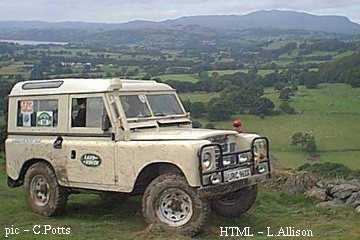 Below: My Landrover Santana the picture was taken at Bala in Wales this year - Chris Potts, Golborne nr. Warrington, England [9/2001]. The Santana Series-III range of Land-Rovers used the trusty 2.25L 4-cylinder petrol and diesel engines, but they also offered 6-cylinder versions, literally having two extra cylinders of the standard dimensions, leading to 50% more power and torque, and weight, without the need for fleet buyers to carry more than a few extra spare-parts. The extra length of the 6's necessitated the radiator grille being moved forward so that it was flush with the wings, although the bonnet itself was not lengthened. The standard Solihull series range of short wheel base (SWB, 88") and long wheel base (LWB, 109") models was offered with soft-top, hard-top, pick-up and station wagon bodies. A version of the 2A forward control known as the Santana 1300, was even offered in the 1960s. All used live axles and leaf springs. Special local models included the Ligero military SWB introduced in 1980 and based on the British light-weight with its cut-down wings and body, and the forward control Modele 2000. The Modele 2000 was introduced in 1981 and came as a cab-chassis, pick-up, drop-side tray or crew-cab. The chassis weight of 2360kg and maximum laden weight 4360kg gave a payload of up to 2000kg. It was based on the British Army's FC 101, keeping the 101" (2565mm) wheelbase, with a slightly more civilised, hard-top cab, and a choice of Santana's 6-cyl petrol or diesel engines, not the British V8 -- Lloyd Allison.